All kids, girls included, are fascinated by dinosaurs (keep reading to learn why). Most of them will have a 'dino period' and colouring dinosaurs are a great activity for them. Colouring pages and books challenge young kids imaginations and are a cheap after school activity. You can either print free dinosaur colouring pages or buy some dinosaur colouring books. Let me know: does your child love dinos? If you are a child psychologist you would probably refer to scientific explanations with reference to several official studies. If you are a Mom you are probably charmed your little one is so involved with something. The answer is probably somewhere in the middle. Kids tend to develop an interest in dinosaurs at a young age – before eight years old and earlier. Some of their first toys may well be dinosaurs. At that age their imagination is very active and there is little doubt these creatures stimulate imagination. They are big and scary – and extinct. Unlike the monsters that live under the bed, youngsters comprehend at some level that dinosaurs, although they are big and scary, they no longer exist so offer no threat to them. They are not so convinced about the monster under the bed. To a little boy the sheer size of these animals must seem immense. As such it is easy for kids to see them as some sort of hero – as being unbeatable and so they pretend to be dinosaurs where nothing can touch them, nothing can beat them. One theory prescribes that playing at dinosaurs is an acceptable way of throwing a tantrum – it’s hard to discipline something that is indestructible. Also the vast array of shapes and sizes must be attractive. There may also be something in the theory that dinosaurs are part of an imaginary world that is acceptable to adults. Kids are often told magical creatures they have heard about in fairy tales don’t exist before they are ready to let them go – dinosaurs on the other hand are mystical figures they can hold onto. They can see them in museums, stand beside the skeletons so they know they are real. Alongside that is the mystery of the beasts, after all kids can see lions and tigers in zoos and live on TV. Dinosaurs on the other hand are seen only through discovery – a picture of them built up through fossil finds and sometimes, through speculation. As such they are mesmerizing. And let’s face it the story of these huge creatures who actually walked the earth millions of years ago have a fascinating story. By the time children reach ten or so it may well be the paleontology that holds their interest and their early fascination with toy dinosaurs may well develop into an interest in studying them or in hunting for fossils and so on. Of course the explanation could be really really simple – dinosaurs are cool. 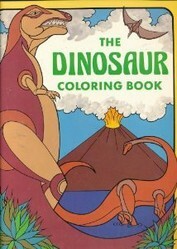 Buy a Dinosaur Coloring Books Today! Stained glass style coloring pages. Color 8 cute and simple dinosaurs. Hand them in a window to make a fun stain glass effect. 32 wonderful coloring pages all about dinosaurs. Teach them all about these pre-historic creatures while they have fun. Suitable for children over 3 years old. These are some great coloring sheets. Kids will be thrilled! They will be able to showcase their beautiful dinosaur coloring skills. these pages double as posters! They are quite affordable too. Could make a nice present. Great idea! My daughter's just been learning about dinos at school and she enjoys coloring too - sorted ! My son was in love with dinosaurs when he was younger, then in his teen years, that love evolved to a love of dragons. He would have loved those color yourself posters of dinosaurs!